Olerud stared at the look on his daughter's face. What it said stabbed him in the heart. What's going on? I thought you were my dad, protecting me, and you're holding me down and allowing them to poke me? How can you say you love me and let somebody do this? This is the feeling, the helplessness, that parents of special needs children experience, and John Olerud knows this. Olerud, a 36-year-old veteran first baseman who joined the Red Sox May 26 after signing a minor league contract earlier in the month, has lived it for four years, raising Jordan with his wife, Kelly. Jordan was born in August of 2000 with a unique syndrome called tri-some 2p, 5p-. She has an extra second chromosome and is missing part of her fifth chromosome, a condition that left with her with a confluence of birth defects that affects almost all of her bodily functions. Jordan eats through a tube and needed a feeding pump her first two years. She cannot walk yet and only says an occasional ''yes" or ''no." She's undergone five surgeries and roughly a half-dozen other major medical procedures, including having ear tubes implanted. The Oleruds have taken her to doctors for her respiratory and pulmonary systems, taken her to cardiologists, neural surgeons, regular surgeons, and gastrointestinal doctors. They've been to just about every department at Children's Hospital of Seattle, where Jordan was born while John played for the Mariners. ''You never expect something like that to happen," Olerud said. ''You figure you're going to have healthy kids. Just not knowing what to expect down the road, what sort of life our daughter is going to have. ''It's tough. It's still tough." While caring for Jordan over the past two years, Olerud has endured the roughest stretch of his rock-solid career, overcoming a career-threatening injury and wondering if there was a team that wanted him. Olerud never planned for any of that four years ago. His wife and 2-year-old son, Garrett, were happy and healthy. Olerud never thought he'd leave Seattle, never dreamed he'd be spending the next four years living in and out of hospitals on both sides on the country. Then came Jordan. When she was born, geneticists tried to find matches for Jordan's condition. There were none. It's nearly impossible to know her potential, or how her defects will affect her as she ages. Deeply religious, the Oleruds contend with the uncertainty the only way they can -- faith. ''We believe God has control of all things," Olerud said. ''I don't think Jordan's a mistake by any means. We really don't know what it's going to be for her. Because she doesn't fit into those syndromes where they can say most kids are usually at this point, it's kind of in the Lord's hands." After surgeries and tests, Jordan left the hospital. Once she got home, the Oleruds centered their lives around caring for her, learning why some parents say it should be labeled constant needs children, not special needs. ''For the first two years," Kelly said, ''it was a grind." Jordan needed a feeding pump to receive water and nutrients, and the equipment required constant checkups. She couldn't even crawl then, so she needed help with any kind of movement. Every car ride, every trip out of the house, Jordan's safety never left their mind. Kelly estimates she and her husband got two or three hours of sleep nightly. As much love as they poured out, they received little in return. Jordan couldn't recognize her parents, only staring blankly when John and Kelly were around. The Oleruds focused on three things for Jordan to learn: walking, eating, and talking. Progress came -- and still comes -- year by year, not month by month. Milestones that would seem minuscule to most parents brought tears to the Oleruds: the first time Jordan peered into their eyes knowingly and smiled; the first time she crawled. While Jordan's improvement offered the Oleruds a chance to celebrate, caring for her never got easier. The good moments didn't make the bad ones go away. When she tries to eat solid food, she chokes because her body can't handle breathing and swallowing simultaneously. So the Oleruds mix vegetables with vitamins and administer the food through a tube. Jordan woke up one night gasping for breath, her respiratory system malfunctioning. Kelly rushed to her side as Jordan struggled to the point of exhaustion. Her body temperature shot to 105. She still couldn't breathe. Kelly placed Jordan outside to cool her down, then sprinted upstairs to get a special steroid to conjure enough strength from Jordan for her to breathe until they reached the hospital. When Kelly headed back outside, Jordan was still fighting to live. As Kelly administered the steroid, she was shocked at what happened. Jordan turned around and smiled. ''I'm constantly amazed at her disposition," John Olerud said. ''She's uncomfortable, she's having a hard time -- whether it's respiratory issues or just sick -- but yet, she's got a smile for you. I'm really blessed to have a child like her. Through all this tough stuff . . . I don't think I would be fun to be around. She smiles when she really shouldn't be smiling." That emotion -- that joy intertwined with pain -- parents of special needs children confront is one of the reasons the Oleruds started the Jordan Fund in 2003. 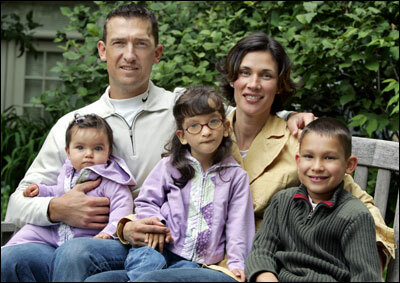 As a baseball player, Olerud had an opportunity to create awareness for special needs children and their parents. The strain the condition has financially and mentally on parents can be unbearable, and the charity would help them. He started the organization in Seattle, figuring that would be home for life. Within a year, he was living 3,000 miles away. In 2004, Olerud hit the first roadblock of his career. From his rookie year with Toronto in 1990, he'd known mostly success. A stellar defensive first baseman with a saccharine swing, Olerud helped the Blue Jays to two World Series. In 1993, he had one of the best offensive seasons of the '90s, batting a career-high .363 and mashing 24 home runs. Olerud played three years for the Mets, 4 1/2 years for the Mariners, and finished last season with the Yankees. Olerud came to the Sox as a .295 career hitter. But 2004 was different. He hit .245 with just five homers through July, when the Mariners released him. For the first time in 14 years, he didn't show up to the ballpark in midsummer. He wasn't sure if his career was over until the Yankees contacted him about a week later. He didn't want to leave his hometown, but he had little choice. The move was the most difficult aspect, with all of Jordan's medical equipment and the concerns of moving her across country. The Oleruds even had to make cubes of Jordan's food and freeze them for the trip. Once in New York, the Oleruds found an apartment quickly, and Olerud found a niche on the Yankees, serving as a backup down the stretch as he hit .280. It seemed Olerud had found a new home. One swing thrust his career back into jeopardy. In Game 3 of the American League Championship Series against the Red Sox, Olerud swung and missed. He crumpled to the ground in the batter's box, clutching his left foot. He thought his bat had struck his foot on his follow-through, creating the sharp pain. Olerud knows now that nothing hit his foot. Twisting his foot out of the dirt, he fractured his Lisfranc joint, the ligament where the big toe meets the instep. The Yankees misdiagnosed the injury, akin to an Achilles' tendon tear, calling it a bone bruise. They told Olerud he could play, and he pinch hit in Game 7. Olerud says he might have been 50 percent, hobbling around so badly he could barely cover first base. Team doctors told Olerud he should heal in a week. Two weeks later, he felt no improvement. Having moved back to Washington, he visited a foot specialist in Seattle. ''How many stolen bases did you have last season?" the doctor asked Olerud. He laughed. ''If that's how I was valuable to the team," Olerud said, ''then it could be a career-ending injury." The doctor, who spoke anonymously, said the injury would have ended Olerud's career if he waited much longer to have it properly diagnosed. Even with that, he almost had to call it quits. Olerud needed surgery to repair his foot, and the Yankees weren't interested in a 36-year-old on crutches when the free agent deadline passed in December. Once again, Olerud found himself without a team. For months, he wondered if he'd play baseball again. ''It's just kind of weird," Olerud said. ''It's that uncertainty of not knowing, is it over? Should I start focusing on family stuff? Should I keep going? It's just that being in limbo, not knowing what's going to happen next, but assuming you'll get picked up. But are you just kidding yourself?" He wasn't. The Red Sox contacted him at the start of spring training, needing a replacement for defensive wiz Doug Mientkiewicz. But Olerud still needed time before he could begin rehabilitation. The Sox stayed patient, and when the time came, Olerud reported to Fort Myers, Fla., for extended spring training. He rehabbed and practiced with players more than a decade younger than him, sweating in the Florida heat like a minor leaguer. No one would have blamed him for calling it a career, for moving back to Seattle with his family. But he had to know he didn't have too many line drives left in his bat before he stopped. ''You know, I had that good year in '93," Olerud said. ''There's always the challenge to get back to that same level, I've got some bad mechanics, some bad habits that I'm trying to get out of. So there's always that challenge. I believe I can get back to that point. And it's driving me nuts that I'm not able to get it." During the offseason, the most difficult of Olerud's career, John and Kelly underwent another life-changing experience. Kelly gave birth to Jessica, the couple's healthy 8-month-old daughter. Jessica amazes them. She can eat and breathe easily and crawl without effort. She can reach out and grab objects with her fingers, something Jordan still can't do. ''We're so thankful," Kelly said. ''I had no idea what an amazing thing a healthy child was. You really gain an appreciation for what an awesome creation we are." If you ask her parents, that's just what Jordan is. John calls her ''a blessing" and Kelly says she's ''a miracle." They're constantly surprised by her resiliency, amazed by her motivation to walk. She has the form down when John holds her up and walks behind her, she just needs the strength and balance. John is sure she'll walk someday, and he smiles when he thinks of that moment. They're bewildered by Jordan's toughness, and never prepared for one of Jordan's beautiful, unlikely smiles. Jordan smiles most around Garrett. John doesn't know why, but her older brother has a wonderful affect on her. She lights up when Garrett comes around, or when she plays in the living room with her tactile toys, scooting around the carpet. Although Jordan likes to hug Garrett, she likes to tease Dad. Olerud will walk up to Jordan, lean down, and say, ''Hey Jordan. Can I give you a big smooch? Daddy wants to give you a big smooch." She'll look down and shake her head. John chuckles as he relays the story. He's sitting in the dugout, having just completed a game of catch with his son with the Green Monster as the backdrop. He's thinking about the lessons he's learned raising Jordan, how much he's learned about suffering, his own and others'. He thinks back to the horrible moment on the doctor's table with the IV, and what he wanted to say to his daughter. I'd love to tell you why we need to get these antibiotics in you, but even if I could explain it to you, you wouldn't understand. You've just got to trust me. ''Sometimes with our suffering, you look to God and say, 'God, this does not make any sense,' " Olerud said. ''I'm getting hammered here, and you could change it. I'm sure he's looking at us saying, I can't tell you why I'm doing this. It is in your best interest, you just have to trust me. ''It's in His control, and He's going to be able to work this for good somehow. You keep going, you keep working at it, you keep loving her and have faith that it's going to work, and this is all part of His plan, and that we're going to be able to help out other people." To make a donation to the Jordan Fund, send to Jordan Fund, P.O. Box 606, Medina, WA 98039, or visit jordanfund.org for more details.